If you’re one of those people that suffers from unusual sleep patterns and you want to get your body back in to check you might be able to do it with this acupuncture sleeping gadget, the Dreamate Sleep Inducer. 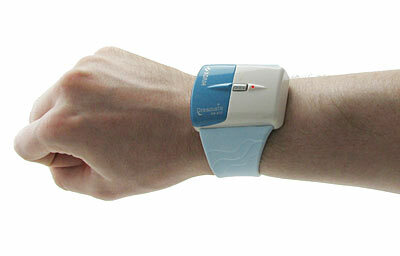 Dreamate uses accupressure techniques to gently massage the “sleeping golden triangle” on your left wrist. Used 30 minutes before bedtime, you can retune and reset your biological clock and train your body to relax and sleep. See results in as little as a week’s worth of use, with best results after eight weeks. These precise pressure points, when gently massaged, calm the body, lower stress levels, and induce sleep. Unlike addictive sleeping pills that knock you senseless, but offer little improvement in your sleep quality. I’ve no idea how effective this is but it sounds kind of cool. The Dreamate is available from TG for $79.99. Darrin, that was exceedingly observant of you. “sleeping golden triangle” ??? give me a break…. i’m quite interesting to this staff, but unfortunately i cannot get any way to buy it in China mainland, so it will be appreciated if there is anyone who can tell me how do i buy it in China mainland. For the person above who said that acupuncture has “ABSOLUTELY NO SCIENTIFIC BACKGROUND to back its claims”, well that is a very misleading thing to say. What is important is whether it can be shown to produce significant results in double blind SCIENTIFIC trials and it certainly does do that. As for the product. I’m not so sure this product can be dismissed so easily by people who imply it works due to only the placebo effect. I have used accupressure bands in the past that worked on a similar principle and they definitely helped with my insomnia. I’m not the type of person who gets taken in easily (especially by skeptics of alternative therapies who act like they know it all) so I’m pretty sure it wasn’t just the placebo effect at work. I think people who criticise this product have not used accupressure bands in the past. I have and they worked for me. do they sell this item here,, because i dont see how can i buy it??? I bought mine on http://www.hivoxproduct.com I think that’s the manufacturer because their warranty is better than anyone else’s I’ve seen. Come on, guys…the being who designs the pages did it. Flipped the left-handed image, so it would “lead the eye”. What an great idea. It sounds loud, in order to help people to have an peaceful sleep which many doesn’t have according to the current world trends. How can one take this product seriously if the image is inconsistent to the instruction (designed for the left hand??). Okay my fellow eggs, first of all, it doesn’t matter which wrist it is on, your right or left is the same so in theory, the so called “triangle” is on both. As for the practice of acupuncture, it is very real. People have gone under surgery and very alert while being cut open and they are eating peacefully as if nothing- it does work if you know the pressure points. Fraize at ThinkGeek makes a good point too, the training itself is vital. When your body is conditioned to a certain time and activity, it becomes accustomed. So you can achieve same eggxact effect with/out this device. Point for Fraize. As for everyone else criticizing this gadget to be false, it’s obvious you have NEVER even bothered trying such a device therefore you have no real worth to your words eggscept for those who have tried it, and even they have said it does work. So who you going to believe? A fool full of sh** who have never even tested the gadget or similar devices, or an individual who has experienced such techniques and it has proven positive? Plus, we all know the Asian use this as a daily practice and their health and life style is very healthy compared to the rest of the world- hmmm something to plunder huh? why everyone trying to pick up on small mistake ? the photographer probably didn’t care about the guide line or the manufacturer forgot to communicate with him. If it acts on pressure points on your left wrist why does the model wear it on his right wrist? Are you supposed to cross your left wrist over your right wrist to use the device? I don’t know if I could sleep like that all night much less hold my wrists in such an awkward position for 30 minutes before going to bed. It would make it pretty hard to brush my teeth. Might as well wear handcuffs. Sounds like a scam especially for that price. well the ritual your body get’s used to could also be the brushing of one’s teeth. One could simply brush his teeth and than go to bed, and in i dunno.. 1-2 weeks of practicing that your body gets adjusted to that ritual and it will become more easy to do and repeat each night! This tecnique is an old time classic in Romania for getting kids in beds at 9 o’clock in school days. And if properly trained it can get your kid to sleep at 11 o’clock in weekends as well and at 9 o’clock in school days. You can obviously set your own sleep hours. Same thing goes for waking up every day, except we don’t brush our teeth, we hear our alarm and than we go to the toilet. It’s not the alarm that get’s us going, we all want to just throw it away when we hear it, it’s the actual whole ritual of going to the bathroom, doing the daily stuff like makeup and combing your hear that get’s us ready for the day! In any case, the longer the ritual, the better it will work! I was put to sleep with 1 hour of PC gaming, than 1 hour TV than brushing of teeth and bed, than woken up after 8 hours by alarm, and going to the bathroom than eating breakfast. As you can see my rituals where a little bit longer, but i never missed a class due to sleeping in, not even in high school or collage! (except when i wanted to skip classes)! That’s a right wrist in the photo! The realisation that you were stupid enough to be parted from your hard earned cash so easily will be enough to keep you awake long into the night. it says left wrist ,but the above pic shows right hand with the gadget, which questions the developers claim of the left wrist golden triangle for sleep. Can you say “Placebo Effect”? LOL more garbage from the pseudoscience crowd! Aren’t they concerned this thing could misalign your Chi, thereby causing an accumulation of Toxins? This is The Worst Watch that I’ve ever purchased. The stupid thing doesnt even tell time! Does it come with an alarm to wake you, after the thirty minutes are up? This probably will work for a lot of people. Yes it is a placebo effect. What difference does it make though as long as it works? One explanation is that putting the thing works on works as a psychological anchor indicating that you are about to fall asleep. Kinda like reading before bed for some people. If I had trouble sleeping and this worked for me it would easily be worth the $80, placebo effect or not. This gadget will be very useful for those who are not in the habit of good sleep at regular interval.